Fellow YBM teachers in an ad! Wow, first off I haven't posted blogs in over 3 months. I'd like to explain to all of my readers that this is mainly because of my crazy schedule teaching English at YBM and a combination of moving back to the U.S. to get my Master Degree! Yes, I am now back home in beautiful San Diego, California attending The University of San Diego to get my M.Ed. in Education: TESOL, Culture, and Literacy. I'm really excited for the program and I will have the opportunity to do some teaching here and advance my skills as an ESL teacher. I'd like to take some time to personally address my experience working with YBM. I loved my experience teaching English in Korea. This article has been on my mind ever since moving to Korea, and now that my 1 year contract has ended I can finally inform my readers. I will be as honest as possible in my evaluation noting the benefits and negatives of working for the company. This is not written to harm any employee, corporation, coworker,student, etc. affiliated with YBM. This is my own personal account which is not meant to be taken as an overall assumption of the company. I would suggest doing further research to gauge an assessment other other companies as well before forming your opinion. If you are a former employee of YBM, or wish to share your personal experience on my blog about teaching at a particular school or company in Korea please send me an e-mail. I would love to post valuable experiences and create a database/network of companies with personal accounts to share with future ESL teachers in Korea. 2009, LMU students after our tour. My history with YBM started in the summer of 2009 when I was in Korea with The Father P. Daly Summer Scholarship in Korea program. The program was built for 4 Loyola Marymount Students to go over to Korea for 2 weeks and learn about Korean culture, industries, and politics. In the program we had a private tour of YBM in which we learned about the booming English Language Economy. First we met with the National Academic Director, Greg Stapleton, who gave us a short overview of the company and its perks. He walked us through each floor of the Jongno Headquarters and then took us to Greg Dawson who was the current academic supervisor for all the teachers in the Jongno office at the time. Dawson paired us up with another teacher and we were able to sit in on different classes being taught that day. Afterwards we went to lunch with Dawson and several teachers to get to know what its like to work at YBM and live in Korea. I thoroughly enjoyed my experience with the company and held on to Dawsons business card as a valuable resource for my future. After finishing my Undergraduate Degree at Loyola Marymount in May of 2010 I was hired by YBM. I contacted Greg Dawson from the Jongno office in Seoul and had a phone interview. He was very accomodating and I was formally hired by the company in Mid-April and started my 1 year contract in September. There was a one week training program before the contract so I arrived in Korea on August 15th 2010. I taught for YBM full time M-F which consisted of 30 teacher hours per week unless otherwise mandated 40 hours during busy seasons. I also taught (optional but I will explain problems with this later) Saturday classes for 3 hours a day during one month of my position, and 6 hour Saturday classes during 9 months of my contract. 2 months of my contract I worked overtime at 40 teaching hours per week and 35 teaching hours per week. Yes, I worked overtime and Saturdays for 11 months out of my 12 months. I really enjoyed the extra pay to fund my travels and savings account! I will not reveal my overall opinion of YBM because I want you to weigh the pros and cons for yourself. With that said, I worked there for one year and found that I was blessed to have the opportunity to teach Adults for 1 year. I taught college students, business men, house wives, professionals, and even Buddhist monks. My students were amazing! I miss you guys! I did not renew my contract the end of the year because I wanted to further develop my skills in Graduate school. 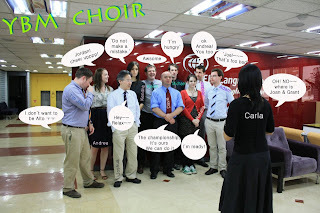 YBM Jongno teachers posing for their staff picture. 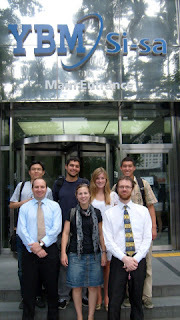 YBM has many benefits that should be carefully taken into account for all interested in teaching ESL in Korea. YBM will always pay you on time and in full. A standard salary is 2.1 million won per month or about $2,000. This can be negotiated slightly with certain TESOL certificates. You are always paid on the 7th day of each month by direct deposit to your bank account. YBM will hire you without a TESOL certification. I was hired without one because of my connection to the school, but decided to do a short online course to get an extra $100 a month pay raise and prepare myself better for teaching ESL. YBM will always give you enough hours. If you want overtime Jongno (in Seoul) is a good location. YBM has a one week training program to immerse you in ESL and provide you with basic strategies for teaching. This training program is paid. YBM will place you in a motel for free during your first 15 days in Korea. Teachers are allows to have class outings with their students. One class per year teachers can go out do lunch/dinner/coffee/movies with their students. This is not funded by YBM and the class must unanimously agree. Central Locations in Seoul and city centers. I loved working at the Jongno office because it is smack in the center of downtown Seoul and down the street from famous historical temples, parks and palaces. YBM will pay for your round trip airfare on completion of your contract. Amazing students! Teaching adults is awesome! The biggest flaw of YBM for me was their strict curriculum for teachers and the rigorous schedule. Review: 1. Elicit the Lesson Aims of the previous lesson. "What did we study last time?" them what kinds of question there were asked. Ask them about their work experience and skills. Model some experience and skills questions and answers on the board. Practice: Q&A (pairs) have the students ask and answer questions about skills and experience using the patterns modeled on the board. Monitor for accuracy. 1. While students are working in pairs near the end of the Main Body, write three or four sentences containing errors (Or commonly mispronounced words) on the board. 2.Bring the class back together. "Let's look at some common mistakes." 1. Elicit this lesson's Lesson Aims. "What was our Lesson Aim today?" 2. Elicit content (Vocabulary, expressions, patterns, explanations, and examples). 3. Outline the main points on the board as students produce them. 1. Communicate the next lesson's Lesson Aims. Refer students to syllabus. 2. Assign any homework and give instructions/modeling. Out at dinner with 2 of my students Level 2 and Level 4. YBM did not tell me they tax my plane ticket both ways and deduct it from my pay check before arrival. YBM will help you find an apartment. But they did not tell me until 2 months after signing my rental agreement that there was a $450 real estate fee. There is also a $300 deposit. This is also taxed. The hours are not likely to be good during your first year. Many locations will tell you that you might have to work a split shift for only the first 3 months. This is not true and my coworkers and I were actually given triple shifts, even worse than a split shift. After your first year, you might have the opportunity to get a block schedule, but this depends on who is highest on the ranking sheet in your office. The office has a sheet with everyone's names on it from the date that they started their contract and this is how the schedules are made. The people that have been working at the company the longest are at the top, everyone new is at the bottom. The people at the top get the best schedules and classes according to their schedule request each month.The most requested schedule by them was the 7am-2pm block. The office has a hierarchy system based on length of contract time. If your family is coming into town or your boyfriend is visiting your schedule probably wont get any better either. In addition, the schedule changes each month so you cannot book any travel plans because you never know what your hours will be for the next month. They will tell you Sunday night before your Monday class starts in my experience. I was exhausted after working the entire day with breaks for 2-3 hours in between, not to mention getting up at 6:30am and finishing work at 10pm. This finishes my personal account of working with YBM. There are many things I am sure I forgot and I will be happy to answer any questions in detail if you leave me a message. If you are a coworker and think I left something out, let me know and I will add it in! I also worked at YBM, but not in Seoul, and the split shifts were killers, but nothing compared to the regime change. I started under a wondeful supervisor, supportive and easy going (the following supervisor was also excellent) but then YBM decided that the teachers were straying too far from the core values and their response was to impose a uniform code on all teachers. In some ways I can understand this, the excesses of some teachers were legendary (I knew a teacher in Seoul who on the last day would write a bar name on the white board and meet all his students there, getting more and more plastered as the day wore on), and YBM decided to rein them in. All teachers balked at this but it became easier to teach, all you have to do is follow the instructions (like a robot). Of course when you are observed (horrible) there is always something you do wrong. And honestly, there are some very petty people working at YBM and this comes out in the notes. A great many people were fired but not all of them for just cause. I am not sure about other teachers, but I found the students often got upset with the lessons (for instance I spent one week talking about pets with a group, none of whom had a pet, but since head office had fired a bunch of teachers I followed the syllabus to a tee). If you are creative and have ideas about teaching, forget YBM. If you are ok with goosestepping through lesson after lesson it may be a good fit. Again ... while I grew to dislike my time at YBM, I realize the problems with running a nation wide franchise and trying to ensure a level of professionalism. I just feel that YBM has gone too far in trying to accomplish their goals. Yes, I agree that the students often got upset with the lessons because of irrelevance. Students need to learn to talk about things that they are uninterested in, however one or two classes is the limit while YBM would have you talk about Pets for 4 classes. Repetition and reinforcement is key for success in language learning. However, such topic based lessons need less of this. The other teachers that were too wild did benefit from the harsh changes at YBM. But the teachers that really care about their jobs were punished. The lackluster teachers that are just in Korea because they don't know what else to do shouldn't be teaching in the first place. The teachers that want to make a difference should not be punished for YBM's bad hiring decisions. Teachers need some freedom in developing lessons for their students based on their interests, weaknesses and strong points. After attending graduate school, I realize that in our YBM speaking classes we only focused on conversational English. This is not sufficient for the students that were taking the class to study abroad in another country. 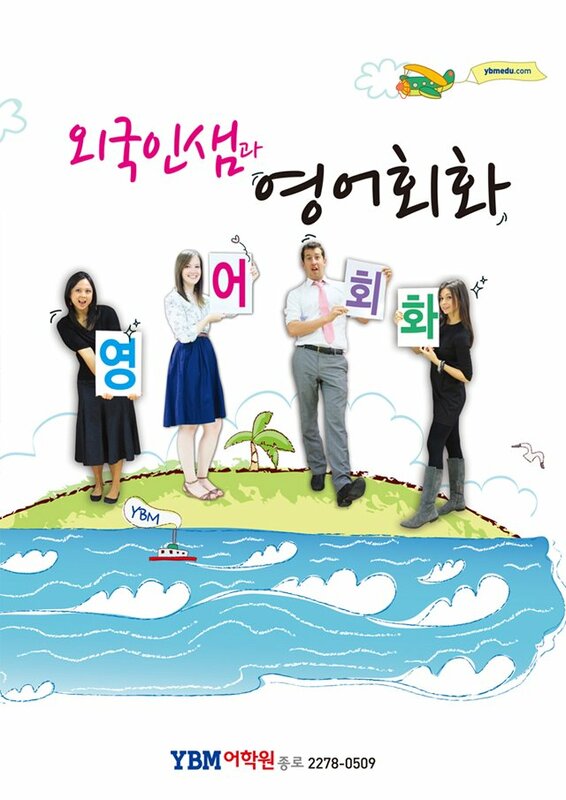 For students trying to leave Korea it is crucial for them to learn academic English so that they can survive in the classroom setting in a native English speaking country. In our Jongno office, there were only 1 or 2 academic writing courses being offered per month. I think if teachers also focused on academic vocabulary in their classes it could provide a more challenging atmosphere for the students that complain about the current curriculum. Here's my story of YBM. I worked at a branch not in Seoul. I accepted the contract because they were the first ones that said yes to my resume in that city, where I have had 2 prior successful years teaching elementary. Pretty sad contract, really; 2 million won, 200,000 housing allowance, etc. I went through my training in Seoul. On the last day of training, the trainer told me that I need to work extra hard to make it, based on my poor performance in training (I was jet-lagged and sick for half the week)After that,he reamed me out because of their lack of coordination of getting us to the schools and the fact that I had alot of luggage. He made me very timid and uneasy. When I got to my city, I was met by a friendlier staff and an academic director who was the coolest guy at YBM so far. Now, on my fist session, I was assigned Talk Time, which is for beginners and I switched days with a Korean teacher.Day 5 comes along. it's my turn to teach Talk Time. The Training Supervisor from Seoul decides to monitor my class.For one thing, this class was the most basic of the basic classes, filled with students who didn't want to be there and were totally unresponsive to everything. I knew this class was going to bomb the minute I said "What did you guys learn from (Korean Teacher) yesterday?" The whole class of 11 students drew a blank.This, on top of the intimidating Trainer critiquing my every step, made a very bad class taught by someone with a spine of jello. Long story short, I failed the evaluation. The Academic Director had a meeting with me and told me he was going to help me be better after this situation. I worked with him to be better, to avoid another train wreck of a class for about one week. My second evaluation went a little smoother, but I was still not up to "par" with everybody, and it seemed little mistakes were blown out of proportion. And all this time, I was never told, verbally nor in writing, that I was in danger of losing my job. I thought, if anything, I would not be allowed to re sign when my year was over. The 3rd one came and this was a little weird. It was a class with one person. I know evaluations are supposed to be made to judge your performance in a typical class situation. If a class only has one student enrolled, that is not typical. In fact, the class should have been cancelled. I was told in training that if only one person is in the class, it is handled differently., since you are acting as teacher and partner.More like a conversation rather than a class. Have you ever had a conversation with a person while somebody else was watching you and taking notes, but not participating? Very uneasy feeling. I was more concerned that the student grasped the concepts then I was about fitting the activities in the right time allotment. 2 weeks later, I was told that I was being let go and they were cancelling my contract. I hold no beef with the academic director there, or the other teacher I worked with. I didn't like split shifts nor the terrible allowance ( I had to pay 220,000 for my share of the rent). So now I'm following the Academic Director's advice and going back to teaching children. I am much happier now. After reading your post I thought, "wow usually it's 'the more things change the more things stay the same' but in YMB's case things actually get worse." I was there over 5 years ago and we had the freedom to design our own lessons as long as we followed the book, more or less. Now they seem quite rigid. I pity the poor students working there. Has Greg learned Korean, in the million years that he's been in Korea? I highly doubt it. It's just more and more of the blind leading the blind. Good to know that they are still having their people work all those Saturdays throughout the year. I am glad that well rested teachers are able to give the students the attention that they need. What a bunch of crap. How about YBM, Korea's biggest English hogwan? Jobs are filled thru advertisement; or recruiters in places like Canada initially get you interested in this dream job. How is the pay? As a reference point, outside of Seoul, a friend took me to visit his uncle's noodle factory. In the factory was a caucasian that turned out to be a Russian working as an illegal, unskilled worker in Korea. I even got to speak to this person. Later I asked my friend to ask how much the illegal unskilled laborer was being payed at the noodle factory. I was shocked to find out that the uneducated Russian was being paid 75% of what YBM was paying me. Just how little does YBM pay? While working at YBM, a quality friendship developed with a Korean employee that lasts even now. It was asked why the staff at the school merely smile and say 'yes' but dont do anything when assistance is requested by a teacher in the staff-member fulfilling their duty? The Korean national first was shocked as they noted very few teachers pick up on this behavior. They then went on to explain that YBM considers the teachers to be the "necessary evil" in having an English school and that management believes that YBM's success is due not to what happens in the classroom, but to quality management. (Note: this is coming from the perspective of a Korean who grew up down the street from this school and was employed at YBM for multiple years.) The explanation went on for fifteen minutes. In the end, the Korean employee noted that management teaches the office staff to have a bias against the teachers and to marginalize them (e.g. smile and say 'yes' but dont really do anything). Twice, teachers, that had to return to their desk during a class to get some forgotten material, stated that they witnessed the Korean manager of the school in the empty teachers' room, rifling thru teachers' desks; one stated the manager was looking thru a teacher's laptop. Note: Western teachers had a Korean liaison, who was there to help smooth out bumps one might have while going thru the learning process of living in Korea and assist the western teachers. Our liason was nothing short of a joke; literally did nothing; and YBM not only knew this, but did nothing about it. One EFL site rates YBM as a 3.5 out of 4.0 points as an employer. That is fascinating. different thing. In addition, "teachers" (fresh university grads with no experience can hardly be called teachers) would routinely find games or internet printouts and then discuss how much time they could stretch out of the exercise (I can get 15 minutes out of this. Oh, i can squeeze 20 minutes out of that internet handout. Really,dude? Well, I can stretch it to 30 minutes!). Moreover, the school had a gang presence whereby the teachers grouped together (the manager was originally from this very same approach) to do as little as possible and even go as far as to coerce new teachers into joining their gang: "If we all do nothing, there is nothing YBM can do about it." Two teachers from this "gang" then went on to be YBM managers! So much for lesson planning. One post notes that there are observations in your classroom. Regardless of there being an observation, it is only there so YBM can say they are doing something; the observations program is by and large a joke with irresponsible teachers continuing on as they had always done. One teacher played board games incessantly and noted he didnt see anything wrong with it. (That's a huge chunk of change spent to merely go play Scrabble!) Six months later, he was in YBM's management program! In one observation, by the school manager, the class literally turned into a circus side-show.....being lead by the manager (one was seeing first hand how a YBM manager teaches!). Even after the class, away from anyone else, the manager came up apologizing for what he had done in the class, by turning it into a circus. This was YBM's observation! YBM states that they guarantee you 120 hours a month working. What does that mean? YBM uses a formula and holds their managers and supervisors to this formula. That is, they underhire for a school and then overuse the teachers present at the school. How does that work exactly? Lets say a school needs ten teachers to fill the needed teaching spots; YBM wants management to hire only seven and then overwork those seven; basically, they are doing the job that ten should be doing. Thus, you are "guaranteed" 120 hours of work (plus, have to work the extra hours of the teachers that were never hired, which becomes cheap for YBM). forty classes per week in teaching, week after week). One teacher noted, complaining to a manager about the ever growing excessive amount of hours and was told by the manager, "I dont like it and you dont like it, but there is nothing we can do about it." Managers have even been eliminated for not pushing this overwork issue to the limit. Why overwork the teacher? It puts money into YBM's pocket and by hiring young, gullible Canadians, YBM can exploit them. Do some teachers like these amount of hours? Sure. The most common heard answer was, "You are exhausted, but when the paycheck comes, you are happy to have the money." Life should have more meaning to a human being than this. The National Director for YBM was at the school and in a meeting was asked why there were no qualifications for teaching at YBM - like a TESOL or a CELTA training certificate. To this he stated: "Arrck, this is Corea! We dont believe in the CELTA; we have our own way of doing things!" Fascinating to watch this behavior and retort. Surely, the next question is, just exactly what is YOUR way of doing things? Of course, there is no answer. Again, YBM recruits young, gullible or irresponsible human beings to be their teachers. Who else would work for them? One YBM teacher posted on an ESL site prodigiously about how wonderful YBM was. This went on for two years. Having gotten to know this person, it was interesting one day as they disappeared. They had literally packed up and left YBM. In an email sent to them in Canada, asking what had really happened in what the teacher was telling the world in his posts was this dream job, the teacher stated, "I just couldnt take it any longer." The reality of the job and what the person was going thru, and what his posts were stating was vastly different. At YBM, you work split shifts. Probably up at 5 or 5:30 A.M. and work the mornings; then back for the evening shift. Most teachers state they spend there weekends (their two days off) "sleeping". Life should have more value to us than to follow this path. Payroll: YBM has an interesting approach to paying teachers; you are payed five to six weeks AFTER the start of your pay period. Think about that, you are payed the following month;where in the world does this happen other than here? And, who would put up with being always payed "next month", but young, gullible Canadians, fresh out of university? Think about the students paying YBM; then, YBM holding on to your money and all the other teachers' money till the following month! That is one huge chunk of change that in financial circles is called a 'float'; we should all be so lucky to hold on to our employees wages so that we have this enormous 'float' to invest and make money off of. One needs to consider the heavy turnover of teachers that it highers. Imagine you favorite company with the kind of turnover: they would be out of business quickly. Do you really want to work for a company with a high turnover of teachers? Well, by now, one surely has the point of this post. So, lets proceed to the exit. There are numerous complaints by teachers about YBM jerking teachers around on their last month's earnings. Some teachers have even gone postal over how they are treated on their last paycheck. Knowing this and having witnessed it, the YBM school manager was approached one month before the completion of this teacher's own contract. The reason for the meeting was to discuss the reputation that YBM has earned in their treatment of departing teachers.The approach was one of politeness, respect and professionalism; no sense in threatening the manager or getting mad. The manager noted that there had been a couple of situations that were merely misunderstandings with departing teachers and the reputation and negative press regarding these complaints was overblown. In talking with the manager, anything and everything was offered to this person, so as to avoid any misunderstandings at the end of the contract regarding the payroll and what could now be done to make the exit process, in regards to the money, go smoothly. The manager noted there was nothing that needed to be done and promised that there would not be a problem; and that there would be a paycheck, in full (as we are on a schedule, the amount of money that would be owed in the last paycheck was specifically addressed) on the last day of teaching. Two weeks before leaving YBM, the manager was again approached as politely and professionally as possible and asked if everything was on track and if there was anything the teacher could do to facilitate the process and final paycheck. Again, the manager said everything was on track, there was nothing to worry about; and there was nothing the teacher could do to assist. He again gave his promise that the final paycheck, in the full amount due the teacher, would be given to the teacher on the last day of teaching. his final paycheck on the last day of teaching; it was literally guaranteed. Friday morning at ten a.m.: there was no paycheck at the school yet. The manager guaranteed it would be there by six p.m..
Two weeks later pay was received; and relief realized......prematurely. While there was pay, in opening the letter, it was only one third of the amount due! In contacting the manager, he promised (yet, again) that the pay would be forth coming...in full. And indeed it was. Later (more than a month after leaving YBM), pay was again received. And that was all that was ever payed by YBM. The lies mounted higher and higher; and the paycheck amount went lower and lower. A university language teacher once noted, Korea is proabably not a good place for the responsible teacher. It is difficult to get solid, reliable information on schools one is considering teaching at. One needs to consider why that is. Additionally, being a facilitator of a language is one of the hardest jobs a responsible person could ever want to have. It is truly a job that one shouldnt take lightly or view it from a romantic perspective. It takes years to have an understanding of the research, computational theory and approaches available in applied linguistics. It is a job for a mature, responsible adult; it is not a gap-year working-holiday; and many university students are mislead by advertisements, certificate programs (one certificate program was taking in teenagers, for chrissakes) and recruiters about these jobs, where you are going to assist another human being, not exploit them. Having been around Koreans since a teenager, I have, for whatever reason, always enjoyed the Korean culture, food and friendships. No matter where I live, I find quality friendships with Koreans. Though having taught in other countries, this is what drew me to Korea. Being in Korea for the first time, I was surprised by the enormous number of Canadians teaching English in Korea. Why is it that Korean businesses recruit and hire Canadians? In talking to an Irish teacher, who had lived in Seoul for five years, it was stated, "Koreans like Canadians because they are easy to push around." In talking to a Korean friend, he stated, schools seek out Canadians, because "Canadians have rubber backbones". Back home, I walked down the street to my mother's best friend's house; a lady known for her directness. I posed the same question to her. She stated, "Koreans like us because we are easy to push around; we dont have any backbone." Fascinating. One needs to also take into account how much of a cash cow the EFL water wheel really is: books, tapes, cd-rom, dictionaries, electronic assistance, classes, test preparation, and of course, the enormous fees gained from advertising on esl starbucks internet sites. Think about it, those sites that you feel are informational and valued by their administrators as worth more than a grain of salt, exist solely for the huge profits they get from advertising; and your korean hogwans (schools) are some of the biggest advertisers; and so, the internet site has to keep their advertisers safe and free from criticism. As one Korean female stated, "Korean mothers live in fear of how poor the government school system is in Korea and so this has created a feeding frenzy and the growth of hogwans to go after the Korean mother's money and prey on her fear." Just as any predator works on prey that is easy to take down (e.g. the weak and the young), one might ask why the Korean schools have a strong recruitment presence in Canada and hire those (gullible?) fresh out of university? I wonder how much of your troubles with your school can be put down to communication problems between you and person that hired you. My supervisor at YBM was very up front about housing costs, schedules, taxes, and like. Not to say that the job doesn't have its downside, but given what you had to say about the pros about working at YBM, I don't see the cons as being anything more than a result of poor communication skills. yes, the communication skills were very poor. When I was told the plane ticket was free, I asked numerous times FREE AS IN NO COST AT ALL. No one ever mentioned that it would be taxed. Also, they said that the company would take us to look at apartments for free. This is because it is free, but they never told us that the apartment itself charges a real estate fee. This is how they avoid telling you about the extra costs. Its not that big of a deal in the long run, but it would be nice if my supervisor had been more upfront, but because my supervisor had only been in the position for 1 month, he was still learning things himself. Still, I would like to thank YBM for screwing me over last year. If it wasn't for getting canned, I wouldn't be living where I am now i a nice one room near a beach, have all the social connections I have now, (networking is important here) and a positive outlook on life. When it first happened, I was angry, but in retrospect, I think it wasn't really a good fit for me anyway. I can look back and laugh in amazement about how stupid I was to sign sich a crappy contract. Interesting reading! The pay is truly a scandal. In dollar terms, I made more at YBM in 1992, when I worked at YBM ELS Gangnam--salary was 1.05 million won, which was $1400 or so, with housing in a shared two-bedroom apartment five subway stops away. Apts. were quite livable after a thorough cleaning to eliminate the pizza boxes, centimeter of grime, etc. When I arrived, I had had two years experience teaching English in the Peace Corps, and was the least experienced teacher on the staff. People had MAs, exp at the British Council, etc. Some games, sure, and "coffee time" was allowed once a month, but good lessons. No required content. Senior teachers shepherded the newbies for a few months, getting them used to a one-page handout of tentative 'goals' for each level. All vacations were blocked for one week--June, Chuseok, Christmas. Heck, I bet the overtime rate back then of 13,000 won is not much worse than what they're paying now! Amazing good times teaching. Does anyone know the name of Mr. Stapletons supervisor? I would relly like to have a chat with them in regards to issues such as Unfair business practice, Unfair labor practices, conspiracy, Jurisdiction, Venue, Diversity of parties...etc. I am extremely disturbed by the lack of professionalism which I have encountered in my limited dealings with this organization. Should anyone be interested, I would be more than happy to recommend competent legal council for civil causes of actions in US courts against this organization. Please feel free to post a response. Good evening, thank you for the blog. It has been very helpful to me, for I am consider teaching English, myself, in Korea. There was one concern I have though-Does YBM pay for airfare in advance or after the completion of teaching? I have done recent research through USATEACHERS. This particular program pays for airfare in advance. USATEACHERS also house teachers in teacher's apartments. Does YBM only provide room and board for 15 days in motel then it would be up to self to provide own living conditions? Yes they do pay in advance for airfare. And they will provide you a housing allowance and assistance finding an apartment. YBM ELS is a disaster. I taught for 8 years, 4 of them in Korea, but YBM was by far the worst place I ever worked. They treat you like dirt, even though they're nice at first. I'm surprised nobody mentioned the week of hazing, er -- I mean training. The triple shifts and mandatory overtime and the observations were killers. Again, worked in Korea a long time, but this place is terrible. I worked at the one in Daegu. Don't let their nice facade fool you. Well I was about to send my resume to YBM a little bit ago...but I guess I'll hold off :P Thanks for all that insight! Do you have any idea many leave credits YBM has? Hello I just wanted to say that I did the exact same thing you did. I taught ESL for 3 years in Korea. I was in Jullanamdo Soon Chun for a year and then I taught in Seoul for the next two years at ECC Yeongdeungpo and at the YBM Sisa in Shin Chon and Jong-no. I then came back to the U.S. in 2001 and I got my M.Ed. at UCSD in 2005. So, if you see Chris Halter, Rachel Millstone, or Marcia Sewall. I'm sure they'll remember me since I'm the only one they would have ran through in the program (as far as I know) who also taught in South Korea). First of all, almost all Korean Hagwons are run for money not for quality education. Hence, they don't care much about quality but appearance. Billions of dollars spent on English education only. How many fluent English speakers do you see in Korea ? Second, Korea is a land of standardisation and cookie cutters. What they exactly want is a robot who will follow their every exact command. Samsung, the biggest conglomerate in Korea, has its own standardised test you need to pass to work there. How do I know all that ? I've been working at YBM from Canada for the past two weeks. I "teach" ten minute phone classes. Having read the above, should I worry about my first paycheck? Most of the people here don't know what they are talking about or are referring to years ago. Some are most likely disgruntled past employees who have been let go as with most review sites. While every big company has its pros and cons, if you are professional and organized and have a good work ethic, this is a place to consider joining. It is not for everyone, but the pros outweigh the cons and everything was professional and handled in a fair manner. In addition; YBM usually has no "senior" looking after you if you have any problems, on the computer, especially the "night shift"
After reading the majority of blogs, over half have nothing good to say about YBM. It's true and the pay is horrible and the initial "niceness" is all corporate BS..... If you are a qualified teacher, don't give YBM your time of day.